June will be a busy month for any art-lover, as several of the capital’s biggest and most prestigious institutions open new exhibitions. For the past 250 years, the Royal Academy has put on an annual display of contemporary art in their Summer Exhibition. This year Grayson Perry curates over 1200 works of art by emerging and established artists across a variety of media. Alongside this year’s showing, the RA also run a concurrent celebration of this tradition in The Great Spectacle: 250 Years of the Summer Exhibition. 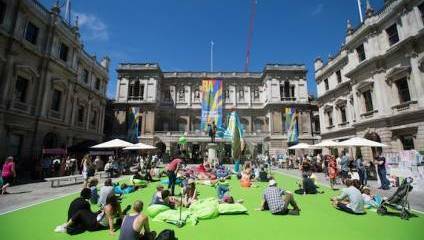 Since its inception in 1769, the Royal Academy’s Summer Exhibition has attracted artists from all works of life and given Londoners the opportunity to see and respond to work that has been created in the very recent moment. In this retrospective, there are works by several of the Old Masters such as Joshua Reynolds, Thomas Gainsborough, Thomas Lawrence, as well as eminent Victorians J.M.W. Turner and John Everett Millais and contemporary artists such as Peter Blake, Tracey Emin and Wolfgang Tillmans. These two complementary exhibitons are a wonderful way to ponder on how artists have always sought to respond to their contemporary moment. The National Gallery also opens two exhibitions in June that are in deep conversation with one another. The first, Thomas Cole: Eden to Empire, displays a selection of the British-born American painter’s most famous evocations of the American North-eastern landscape. Though one of the most influential painters in the U.S, particularly through his membership of and influence on the Hudson River School, Cole is not necessarily as well known in his home country of the UK. The exhibition is a rare opportunity to view some of Cole’s best-known works, including his series ‘The Course of Empire’ and ‘The Oxbow’ – the latter of which has never been seen in this country. The Gallery also displays a response to Cole’s expressive vistas, with a selection of ten works by American artist Ed Ruscha entitled Ed Ruscha: Course of Empire. Ruscha’s work is most obviously linked with1960s Pop Art and 1970s conceptual art. Several of his works play with logos and advertising – he was trained as a commercial illustrator – and explore the tension between word and image. Ruscha also gained fame through his photographs and paintings of mundane places, most notably gasoline stations in his 1963 book, Twentysix Gasoline Stations. Here Ruscha provides painterly rejoinders to Cole’s unspoilt American landscapes with his focus on the utilitarian industrial architecture of contemporary L.A. If that’s enough painting for you, why not head on over to the V&A where curators bring the possessions of renowned Mexican artist Frida Kahlo to the UK for the first time, in Frida Kahlo: Making Her Self Up. Kahlo produced many striking paintings and self-portraits, and used both painting and dress as a means of self-expression, as a way to explore not only her own health difficulties and relationships, but also question national identity and female agency. In this exhibition, the curators have selected several important objects, from her eyebrow pencil and lipstick, to her shawls and hand-painted medical corsets to display in conjunction with her painting and information about her life. The exhibition also reimagines her famous Blue House where Kahlo was born, lived and died. It’s not just the large galleries with new openings this month; also in June, and running until September, the Ben Uri gallery in St. John’s Wood hosts 40 major works of artist David Bomberg. Founded over 100 years ago in the Jewish ghetto in Whitechapel, Ben Uri Gallery and Museum places an emphasis on sharing art created by Jewish artists, whilst also exploring the relationship between art and migration. Bomberg was the son of Polish immigrants and was raised for the most part in the East End of London. He became known as one of the ‘Whitechapel Boys,’ a group of Jewish writers and artists who had been brought up in that area and created a lively and exciting pre-war creative scene. To honour the 60th anniversary of Bomberg’s death, Ben Uri displays some of his most prominent works, and track his career from his early work to his wartime response, to his later landscapes in Spain, Cyprus and Britain. Don’t miss the opportunity to catch the first full exhibition of Bomberg’s work in over a decade.